Welcome again to a ROADTRIP-'62 ™ discussion of things from 1962! My name is Don Milne and I'll be your travel guide on this virtual tour of history. Today, we'll be discussing shipping on oceans, lakes and rivers and how that relates to the world of 1962, the world before, and the world today. This is part of my plan to discuss a different topic every other week, usually related to the segment of US-23 we just traveled the week before. I hope this allows those of you not familiar with 1962 a chance to learn new things, and those of you who saw it a chance to remember. By the time we travel to the south end of US-23, we should all have a pretty good idea of just how 1962 fits into today and yesterday! So find yourself some dock space, plop yourself into a nice deck chair, watch the ships pass, and let's check out a little history. Our trip on US-23 is rather unusual in that we never see the ocean but at both ends of the journey we can see ocean-going ships. Here at the north end in Mackinaw City, Michigan, we can watch them gliding under the Mackinac Bridge as Lake Huron changes to Lake Michigan. And at the south end, we can see the ships plying the waters of the St. John's River under the Main Street Bridge in Jacksonville, Florida. Both situations, and many others we shall see along our way, are only possible because of public works projects that expanded and improved these shipping channels over the centuries. In all of these cases, this inland shipping was historically possible for the small boats of a past time, but as boats became larger we literally had to make the rivers larger. Much of this improvement occurred in the 1950s, so that we could have seen the results on our 1962 trip. We've just spent three days along Lake Huron, watching both lake freighters and ocean-going ships deliver the goods. In a couple of days, we'll cross over one of the last two points we can see these, the other being at Toledo, Ohio. All of this ocean shipping, and some of the lake shipping, is possible because of a project called the St. Lawrence Seaway. This system extends from the Atlantic Ocean to the head of the Great Lakes, at both Chicago, Illinois and Duluth, Minnesota, a distance of 2,340 miles inland. Perhaps nowhere else on earth can ocean-going vessels travel so far inland. Though the Seaway as we know it was opened in 1959, attempts to travel through the Great Lakes wholly by water were begun almost as soon as Europeans found the lakes. The Native Americans had long traveled along and between the lakes by canoe, but needed to portage between lakes and around waterfalls. In 1680, Dollier de Casson, the Superior of the Sulpician Seminary in Montreal, Quebec began work on a short bypass of the Lachine Rapids, signaling the start of digging that has never ended. Four small canals on the north shore of the St. Lawrence River were built in 1783 by the Royal Army Engineers. These were only 2.5 feet deep and 6 feet wide, but they had a total of five locks along them. The locks were the first built on the St. Lawrence River, and possibly in North America. A much more ambitious project was completed in 1833, when the first version of the Welland Canal bypassing Niagara Falls was completed. It was constructed by a private company, the Welland Canal Company, was 27 miles long, and required 40 wooden locks to lift sailing ships up the 326-foot height difference between Lake Ontario and Lake Erie. Over the remainder of the 19th century, several more canal and lock systems were constructed around obstacles, and in 1895 a joint U.S.-Canadian Deep Waterways Commission was established to study the feasibility of a Seaway. The fourth and final version of the Welland Canal was completed in 1932. This is considered the first step in the completion of the modern Seaway. This canal is still in use, having been deepened in the 1950s as part of the St. Lawrence Seaway project, and further straightened in 1973. The original 40 locks have been reduced to only eight. Also in 1932, Canada and the U.S. sign the Great Lakes-St. Lawrence Deep Waterway Treaty. As with so many other projects around the world, World War II halted all work. Established railroad and other interests also opposed spending public monies on such a project, as inland shipping would compete with them. But by 1949, negotiations came back to life and a new study was undertaken. Various joint shipping and electric power projects are begun in 1951 that prepare the way for the final improvements. Work on these final segments begins in 1954, after creation of the Canadian St. Lawrence Seaway Authority by Parliament, and the creation of the Saint Lawrence Seaway Development Corporation by the United States Congress. The Great Lakes St. Lawrence Seaway System is a deep draft waterway extending 3,700 km (2,340 miles) from the Atlantic Ocean to the head of the Great Lakes, in the heart of North America. The St. Lawrence Seaway portion of the System extends from Montreal to mid-Lake Erie. Ranked as one of the outstanding engineering feats of the twentieth century, the St. Lawrence Seaway includes 13 Canadian and 2 U.S. locks. $470.3 million, of which Canada paid $336.5 million and the U.S. $133.8 million. The segment between Montreal and Lake Ontario was the most challenging, requiring seven locks through unexpectedly hard rock formations. The icebreaker "D'Iberville" began the first through transit of they Seaway on opening day, April 25, 1959. A dedication ceremony was held in Massena, New York, attended by Queen Elizabeth II and Vice-President Richard M. Nixon. In the first navigation season, 25.1 million tons of cargo were moved through the Seaway. For you facts-and-figures buffs. The system was deepened some in 2004, allowing vessels up to 26.5 feet deep to travel through the locks. These 19 locks raise ships a total of 590 feet above sea level by the time they reach Duluth. Each lock requires about 24 million gallons of water to fill and can be filled in 7-10 minutes. The modern ships that travel the Seaway are up to 740 feet long and 78 feet wide. Travel to Duluth under normal weather conditions takes about 8.5 sailing days. Almost 50% of Seaway traffic travels to and from overseas ports, with ports in Europe, the Middle East and Africa being the heaviest. The remainder of traffic is Great Lakes shipping. The tonnage shipped continued to grow, with 1962 traffic of 25,300,000 tons passing through the Welland Canal. Tonnage at Montreal, Canada was up 9% over the previous year. An unusual feature of shipping on the Great Lakes, that you do not find on an ocean or river, is that over the winter months ice closes the lakes to navigation. Icebreaker vessels are used to extend the season some, and several of the lakes do not completely freeze over because of their depth, but the lakes are closed nearly every year. A problem that was not of much consideration back in 1962 is that of non-native invasive species introduced to the Great Lakes and tributary rivers by ocean-traveling ships. Because the lakes also have been connected to the Mississippi River system, species have moved relatively freely all over the country. Later in the trip we may see barges on the Ohio River that come from the port of Chicago, so everything can move everywhere. Recently, new laws have been adopted to require ocean flushing of parts of the ships, to reduce introduction of species into the lakes. A recent study of the St. Lawrence Seaway concluded that the drastic measure of closing the Seaway could not guarantee prevention of further invasives. Such a closure would instead have large negative economic impacts all around the world, as we have come to depend on the global connection of markets. At our final glimpse of the system from US-23, as we cross the Maumee River at the Port of Toledo, almost 90 percent of the tonnage moved through the port is either coal, iron ore, or grain. Because of this, the Port of Toledo includes specialized docking areas for coal and ore on its mile-long docks. The terminals have a 22 million bushel storage capacity, with corn, soybeans and wheat being the major grains shipped. Iron ore, or Taconite, and coal can be moved either to storage or railroad: much of the coal that ships out of here on the Seaway comes from mines we will pass along US-23, and is shipped here by rail. Toledo has excellent railroad connections, allowing cargoes to be transferred between rail and ship easily. Without the St. Lawrence Seaway, this transhipment would have been necessary at ocean ports, raising shipping costs for mid-America. Something that we can see a lot of today, but not in 1962, is overseas container shipments. Something else we can see today, closeup, is a lake freighter. The Col. James M. Schoonmaker is now docked at the National Museum of the Great Lakes in the Maumee River at Toledo. This ship, known as the Willis B. Boyer after 1969, plied the Great Lakes from 1914 to 1980, so we could have seen it in action while driving US-23. At the time of the Revolutionary War, the Great Lakes were not yet a major transportation corridor because there was no convenient way to reach them from eastern ports. As we have seen, the St. Lawrence River was considered, but major improvements there had to wait hundreds of years. The first connection was much earlier, in 1817, and much smaller. As early as 1787, George Washington and Thomas Jefferson had discussed a national system of canals, with one canal being a connection of Lake Erie with the Ohio River. The War of 1812, some of which took place on Lake Erie, ended this discussion but in 1816, New York's Governor DeWitt Clinton broke ground on a canal connecting Lake Erie with the Hudson River and New York City. Seeing the Erie Canal becoming a reality, Ohio commissioned the first canal feasibility survey in 1822, to help ensure a modern and reliable transportation system. Ohio began construction on both the Ohio & Erie Canal and the Miami & Erie Canal in 1825. Just two years after the groundbreaking, the first travel aboard a canal boat from Akron to Cleveland took place. Work progressed quickly and by 1832, the entire 308 miles of the Ohio & Erie Canal was open. It required 146 lift locks over a rise of 1,206 feet. Our route along US-23 crosses both canals, and even follows about 75 miles of the Ohio & Erie Canal route, from Lockbourne to Portsmouth. At Toledo, Side Cut Metropark holds three of the original six locks of the Maumee Side Cut, a part of the Miami & Erie Canal. This was Ohio’s other major canal, connecting Lake Erie to the Ohio River at Cincinnati. This canal ran 249 miles, but took much longer to construct than the Ohio & Erie Canal. By 1830, it only ran from Cincinnati to Dayton. It was extended to Toledo in segments, often to satisfy politics, and not completed until 1845. Though only these few locks remain near US-23, west of Toledo along US-24 you can see much more. At Providence Metropark in Grand Rapids, Ohio, you can take a 45-minute mule-drawn canal boat trip through one of the original locks. There are also other historical buildings at this former canal town, with living history characters to show and tell the history. Ohio's network of canals was constructed between 1825 and 1847, and eventually totaled over 1,000 miles. It was truly a statewide system: forty-four of Ohio's eighty-eight counties had a canal. However, the canal era in the United States was relatively short, unlike in Europe where canals had been used for hundreds of years. Freight traffic diminished quickly after the Civil War due to the construction of railroads. Railroads were more expensive to ship by, but moved the freight so much faster that canals just could not compete. Interestingly, this is similar to what happened to railroads when the Interstate freeway system was constructed. Average speed on a canal boat was only about 4 miles per hour. Thus, the peak revenue years were between 1852 and 1855. As revenue dropped, Ohio leased canals to private owners. These companies earned some revenue from boat operation and also the sale of water to businesses and towns. Eventually, they could not make any money either and the state took the canals back in 1879. Some parts were sold, sometimes to railroad lines who built tracks upon the relatively level rights-of-way. Some parts were filled in to reduce stagnant water for health reasons, and some land was even given away to politically connected persons. By 1913, very little usable canal routing remained. In that year, a massive flood in the Akron area destroyed the last major section and the canal system was abandoned instead of repaired. As we drive US-23 from Lockbourne to Portsmouth, some of the Ohio & Erie Canal was on the other side of the Scioto River. But at Lockbourne, Locks 26 and 27 are visible east of the village, Lock 29 is along Canal Street and Lock 30 is in a park. In Circleville, the stone abutments of an aqueduct over the Scioto River can be seen and a 3-mile section of the canal still has water suitable for canoeing and fishing. Farther south in Chillicothe, some canal warehouses still exist along Water Street. The old canal bed and locks are visible along Three Locks Road, 3 miles south east of town. At Waverly, there is a remnant of Lock 44 along US-23. And a mile west of Portsmouth, the final Outlet Lock at the Ohio River can be seen. These and many other parts of the old canals are well-documented and sometimes preserved thanks to a number of historical societies, including the Canal Society of Ohio, founded in 1961. Most of these historical sites are less than one acre, and less that 20% of the original canal lands are still owned by the state. This is probably as good a time as any to describe how a canal and lock system works, for any of you who haven't seen one. A canal, of course, is an artificial river. Like a natural river, it needs a source of water, so feeder canals are built to bring water from lakes and rivers to fill the canal. Sometimes a river will be dammed to provide a pond, so that the water supply will be assured during for periods of low rain. Because a canal needs to have a relatively level run, it sometimes needs to travel over or under a river, road or railroad. This is accomplished with an aqueduct. Historical aqueducts were usually constructed of stone and lined with clay, 19th century aqueducts often used lighter-weight cast iron troughs, bolted together. Modern construction is with concrete lined with various bituminous coatings. Canals have even incorporated tunnels, to pass under hills and other obstructions. Canals are often constructed over routes not usually served by a river, or to bypass waterfalls and rapids. This means they must travel up and down hills, which water cannot do without help. The help is usually in the form of locks, though sometimes short rail or inclined plane segments were used where boats were moved out of the water. A lock is simply a sort of box full of water, with gates at both ends. When moving uphill, a boat enters one end of a lock, the gates are closed, water is pumped in to raise the water and boat to the next higher level, the opposite gates are opened and the boat travels on at the higher elevation. The process is reversed for downstream travel. Locks are known from as far back as 1180 but the type of lock described here was first used in 1373 in the Netherlands. Modern locks vary only in construction materials and speed of the pumps, allowing them to be filled and emptied quickly. At the Ohio River, we come to a modern system of water transportation once again. The Ohio River and its major tributaries are barge highways today, moving many of the same commodities we saw on the Great Lakes. However, this is a river system, which is much shallower than the Great Lakes. Whereas the St. Lawrence Seaway was dredged and cut to a minimum depth of 26.5 feet, the Ohio River system has a minimum depth of only nine feet. Thus, shallow draft barges are used here instead of ocean-going ships. The Ohio River begins at Pittsburgh, Pennsylvania, where the Allegheny River and Monongahela River meet, and flows 981 miles to the Mississippi at Cairo, Ill. This entire length is navigable and has always been an important transportation route. After the Revolutionary War, settlement of the area west of the Allegheny Mountains increased and most of the people moved down the Ohio River. They used a flatboat, as it was the cheapest type of boat and could float with the current using only poles or oars for steering. In 1811, the first steamboat on these rivers made it possible to move faster downriver and made the return trip easier, increasing commerce. By 1835 there were 304 steamboats operating in the vicinity of Pittsburgh. The rivers were difficult to navigate though, with shifting sand bars, snags, rocks and seasonally fluctuating river depths. As is usually the case, the local governments and river users demanded the federal government improve the rivers. Congress responded by authorizing the U.S. Army Corps of Engineers to remove snags and sandbars from the Mississippi and Ohio rivers. The problem of low water remained, so in 1878, Corps of Engineers began the first federally-built lock and dam on the Ohio River. This was a wooden wicket dam, used to create a pool behind the dam during low water. By 1929, a series of 53 of these dams was constructed along the Ohio River. The final one built, at Cairo, Illinois, is one of only two remaining. As the barges towed became ever larger to haul more cargo, the dams and locks have been widened and reduced in number. This system is still very important to the area, as shipping costs for raw materials average only 97 cents per ton mile by barge versus $2.53 per ton mile by rail or $5.35 per ton mile by truck. We pass one of the newer locks and a dam on US-23, at Greenup, Kentucky. The Greenup Locks and Dam would have been very new back in 1962, as they were completed that year. The project replaced Lock and Dams number 27, 28, 29 and 30 on the Ohio River and Lock and Dam 1 on the nearby Big Sandy River. Hydroelectric power is also generated at the dam, and a bridge crosses to Ohio over the dam. In 1960, only 20 million tons were shipped through the locks, but in 2006 over 71 million tons came through. The main commodity is coal, which is 58% of the tonnage, and which we will see plenty of mined farther south. Petroleum products comprise 12% and iron and steel products another 9% of the total. There is a major oil refinery just up the road at Ashland, Kentucky and steel mills nearby, so these shipments are no surprise. The next lock and dam downstream is the Meldahl, near Maysville, Ohio. Upstream, the next lock & dam is the Gallipolis (Robert C. Byrd), near Gallipolis Ferry, West Virginia. We can watch the barges all the way from Portsmouth, Ohio, where we first sight the Ohio River, down to Louisa, Kentucky on the Big Sandy River. After we travel overland away from the big rivers, we come to an area of the country that no longer uses river transportation, but once did. The valleys of eastern Tennessee and western Virginia were used by the early settlers of these states. In particular, the Holston River was once booming. The Holston flows through the Great Appalachian Valley, being one of the major tributaries of the Tennessee River, forming that river when it meets the French Broad River at Knoxville, Tennessee. Europeans were settling along the Holston before the American Revolution. The Daniel Boone Wilderness Trail began at Kingsport, Tennessee, where US-23 crosses the Holston. Here, at Long Island, Daniel Boone and his men started to blaze the 200 miles of trail to the Cumberland Gap in 1775. The Netherland Inn at Kingsport also had a boatyard, where settlers would arrive by foot or stagecoach and build boats to continue their migration west. In the mid-1800s, the Holston was still a minor transportation river, as it was navigable for light draft steamboats when water was high in the spring. However, by that time the larger boats stopped at Knoxville. 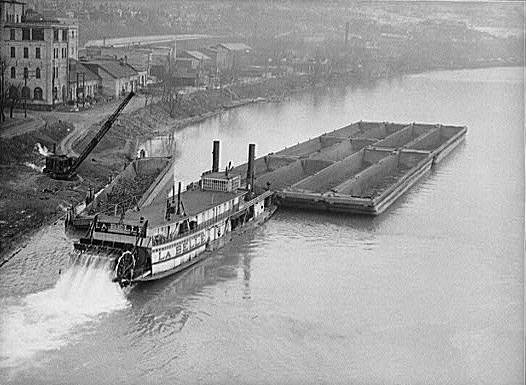 While the Depression of the 1930's was the catalyst for modern development of the Tennessee Valley, it also meant the end of barge traffic north of Knoxville. The Holston River was among many rivers that were dammed for hydroelectric power but were not provided with a lock system. The historic Netherland Inn and boatyard are one of the few things you can still see from that era of river travel. One of the major developments in world shipping in 1962 was the expansion of maritime routes due to the loss of colonies by some European countries. Because the colonial empires were disappearing, other companies could obtain trade at the former closed colonies. There was a temporary glut of new ships constructed as companies rearranged their shipping routes and capacities. One of the new ships was the world's first nuclear-powered merchant ship, the Savannah. Until this time, only military ships had been nuclear-powered. The Savannah traveled the world, beginning with its maiden voyage on August 22, 1962, until the end of 1971. It proved to be too expensive to maintain a one-of-a-kind nuclear ship. After removal of its reactors and moving around as a museum ship for many years, it was found to still contain a high level of radioactive material, so the Savannah now rests at drydock in the the Vane Brothers' Co. shipyard in Baltimore, Maryland, where the United States Maritime Administration is attempting to remove the last of the radioactive material. The Savannah also included 30 first-class passenter suites, and other passenger ships were also making headlines in 1962, with The France becoming the world's longest passenger liner. Nine other large ocean liners were also under construction. Oil was moving around the world in increasingly larger ships also, as the 106,000-ton Manhattan was completed in 1962. The world's largest barge was also placed in service, but we would not have seen it on the Ohio River. The Atlantic Cement Company launched the barge on the Hudson River in New York. An entirely new type of ship was being tested that year also. The first true deep-sea hydrofoil vessel, the Denison, was running tests at Long Island, New York and other hydrofoils for near coast use were placed in service in Italy and Russia. And finally, at the end of our trip, we come full circle back to ocean shipping. At Jacksonville, Florida, US-23 is at its closest point to the Atlantic Ocean. But even here, much work had to be done to the St. John's River to make it a modern port. Jacksonville was declared a U.S. Port of Entry in 1822, beginning its rise to a major port. Even though the city was burned several times during the Civil War, in 1895 trade had become heavy enough that the St. John's River was dredged to deepen the main channel. In just five years, there were 30 private waterfront terminals transferring cargo between ships and the railroads. A municipal dock about 1.5 miles east of US-23, on a bend of the river, was constructed around 1913. Three years later the river was again deepened, this time to 30 feet by the U.S. Army Corps of Engineers. Improvements kept pace with changes in shipping and in the early 1950s the St. John's was dredged to 34 feet deep. We could watch automobiles being unloaded at Jacksonville's port in 1962, as the first shipment of Volkswagon Beetles came in a few years earlier. However, much of the public docking facilities had deteriorated by the late 1950s and freight was going elsewhere. A new Jacksonville Port Authority was created in 1963, so we would probably have seen a rather poor port in 1962. JAXPORT (the current port name) has since expanded and improved the port to the point where it now receives direct container service from Asia. In 1962, container shipping was still relatively new, with the container ships being older tankers cut in half and reconstructed. Something else new since 2003 in the harbor: Carnival Cruise Lines has also sailed from the JAXPORT Cruise Terminal, down a St. John's River that is now 41 feet deep. So even though we aren't at the ocean, we can see just about anything that travels on the ocean right from the end of US-23. I'm going to cross the Main Street Bridge to the park and just watch the big boats go by, but next week I'll be back to our ROADTRIP-'62 ™ journey. See you on old US-23!